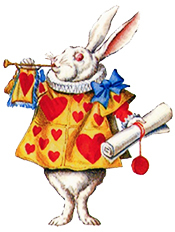 I’ve always enjoyed Alice in Wonderland stories, and grew up singing along with Disney’s version of the tale. Falling down a rabbit hole into a wonderful and mysterious world filled with colourful characters sounds pretty great to me. Even now I frequently get the songs from Disney’s Alice in Wonderland stuck in my head, especially Painting the Roses Red, which I always sing with altered lyrics when I’m painting my nails. 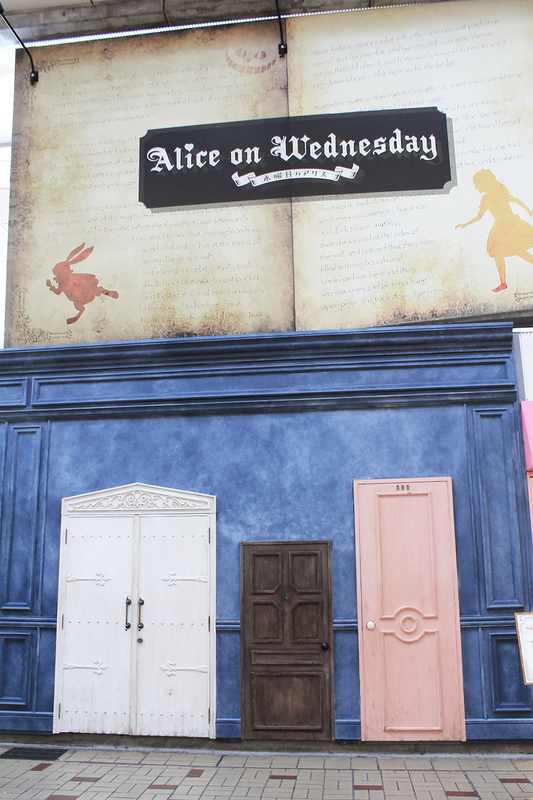 So a couple of weekends ago when we were exploring 大須観音 (Oosu Kannon), a famous shopping area in Nagoya city, I was delighted to come upon this very curious little shop called 水曜日のアリス (Suiyoubi no Alice) or as they’ve named it in English, Alice on Wednesday. To go inside, you have to duck down and through a small door and push past a curtain. 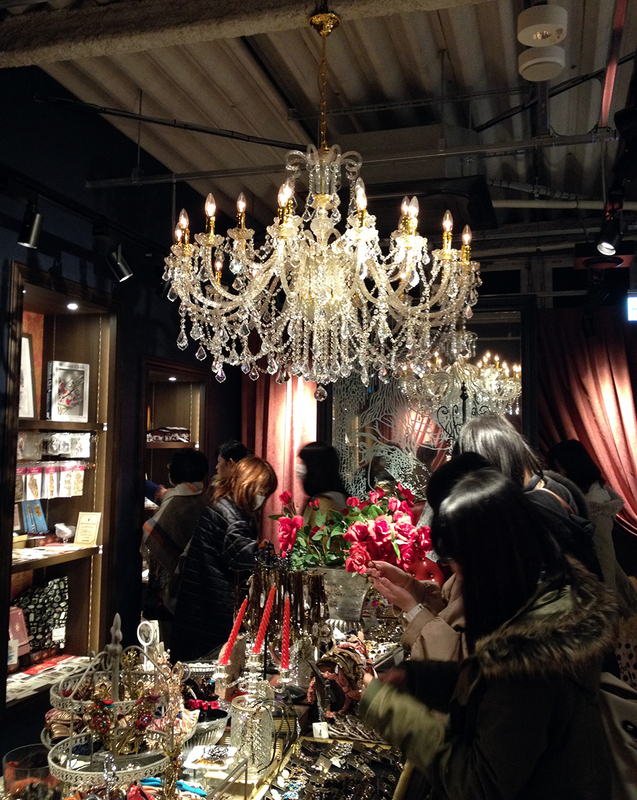 It turns out the store sold accessories and sweets, and was decorated in all things Alice. The concept for the store, according to the official site, is as follows. 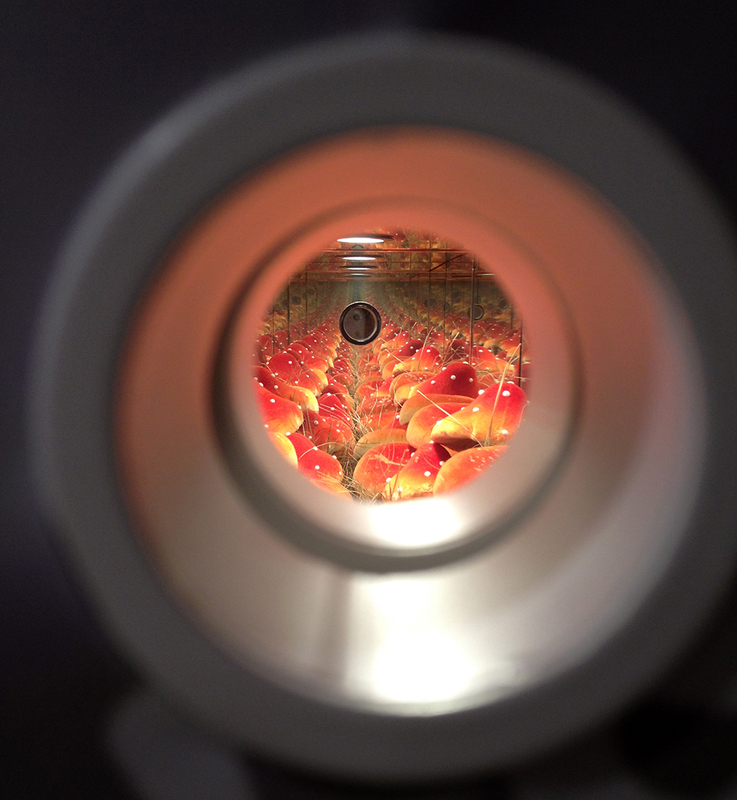 Chasing after the white rabbit, you open a small door to find a curious and cute Wonderland! 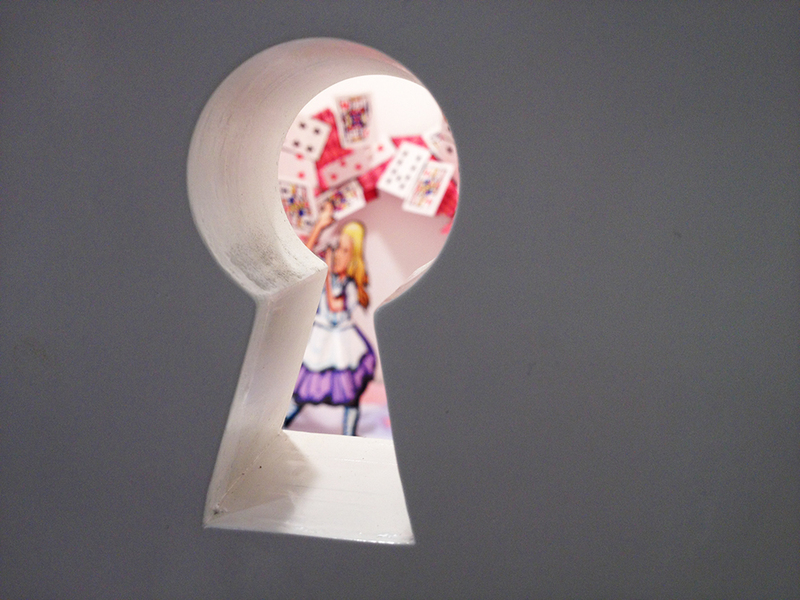 Why not feel like Alice and find the secrets hidden inside [our store] while doing some shopping? 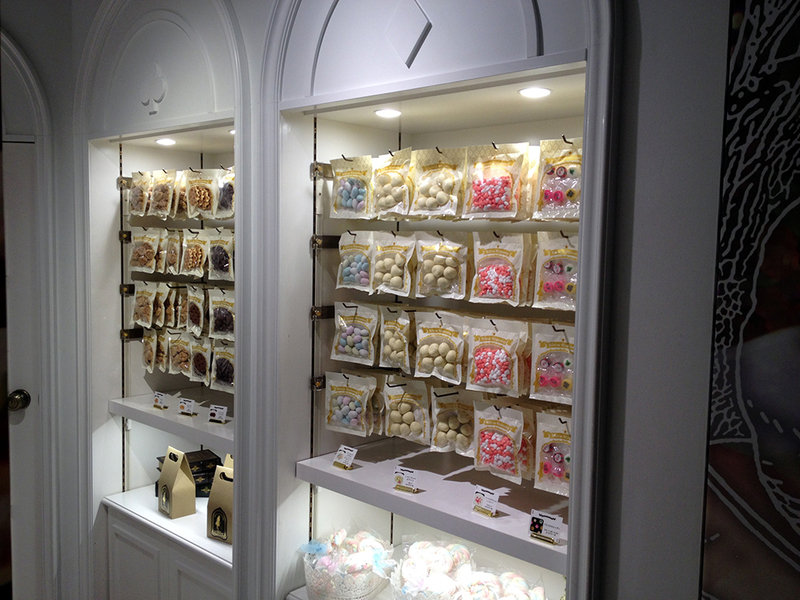 This cute and mysterious shop sells candy, accessories, and other miscellaneous goods. After you go through the door and curtain, you’re taken into a dark room that’s filled with all sorts of goodies. 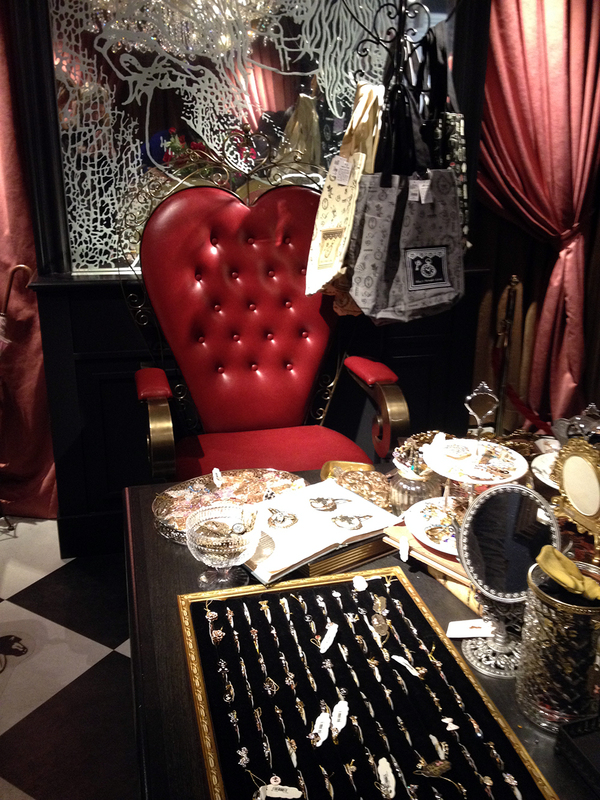 It’s called the the Red Queen’s room, and is advertised as having tote bags, accessories, cups, stationary, and other goodies that all have an Alice in Wonderland motif. 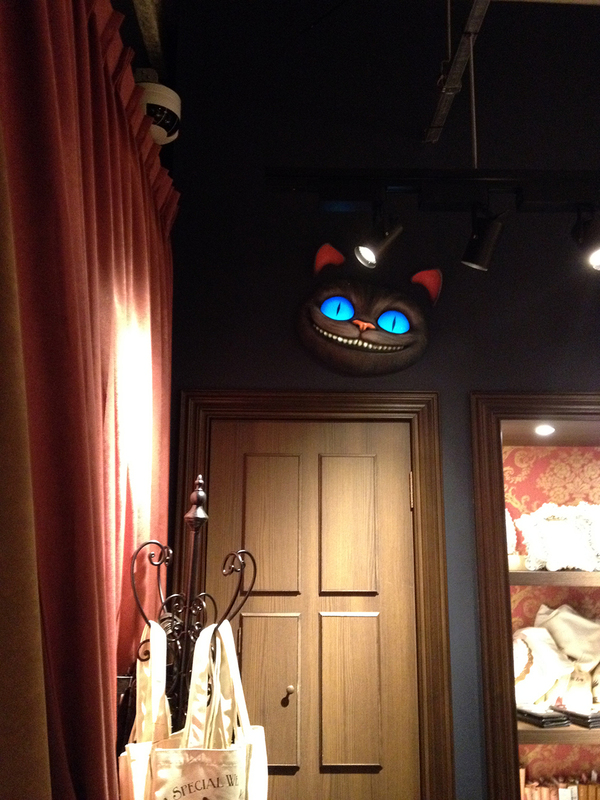 They have a lot interesting accents in the room, like a smiling Cheshire cat on the wall, a red chair with a heart-shaped back, and a chandelier hanging from the ceiling. 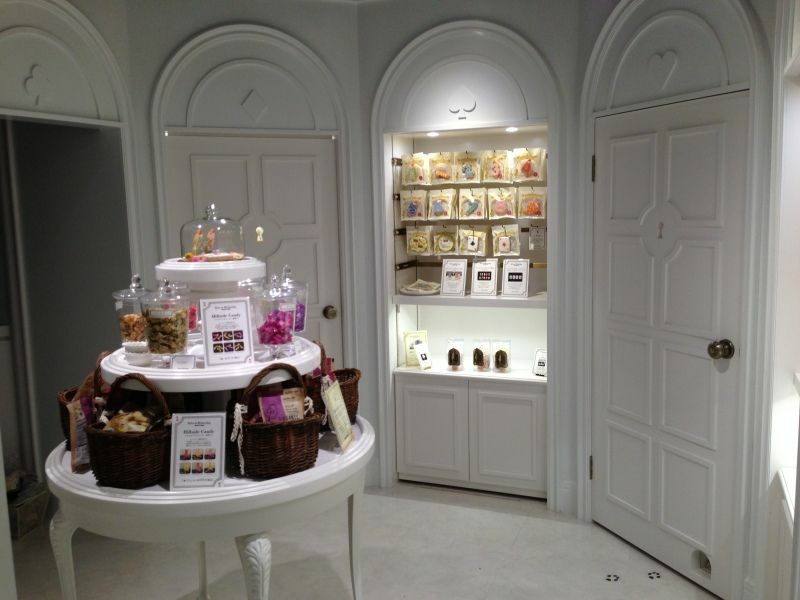 The displays for the merchandise is decorated with teacups and playing cards. 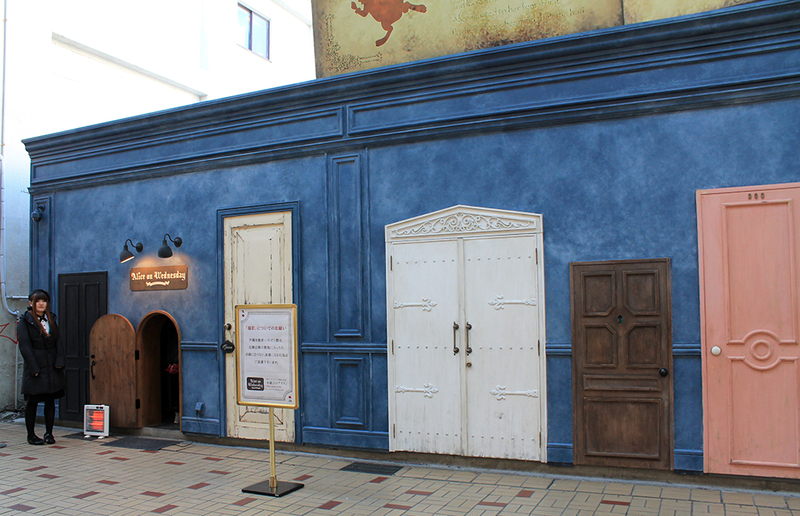 To the right (across from the grinning Cheshire cat) is the White Queen’s room, and it’s filled with cute and colourful snacks, like popcorn, cookies, and candy. The details that they’ve put into the room and sweets are lovely. If you look in the photos, you can see each card suit on the wooden border. Even the “sold out” cards have a little picture of Alice on them. There are cookies that say “Eat Me” on them, and treats shaped like rabbits and card suits. The second photo is from here. 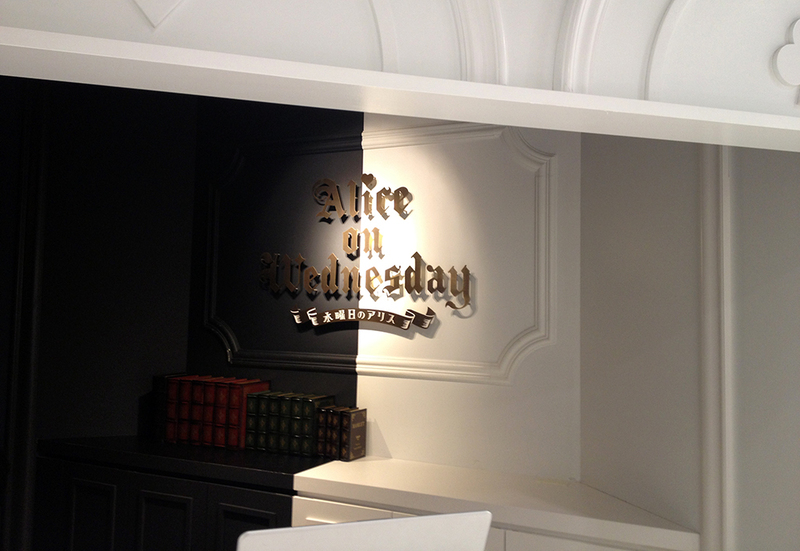 Even the Alice on Wednesday sign at the back of the store near the cash register fits in perfectly with the shop’s theme. 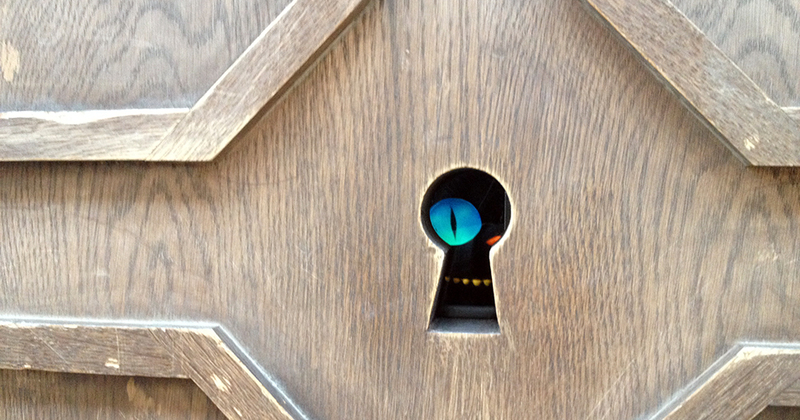 Both inside and outside of the shop you can find little peep holes that will show you an Alice themed surprise! 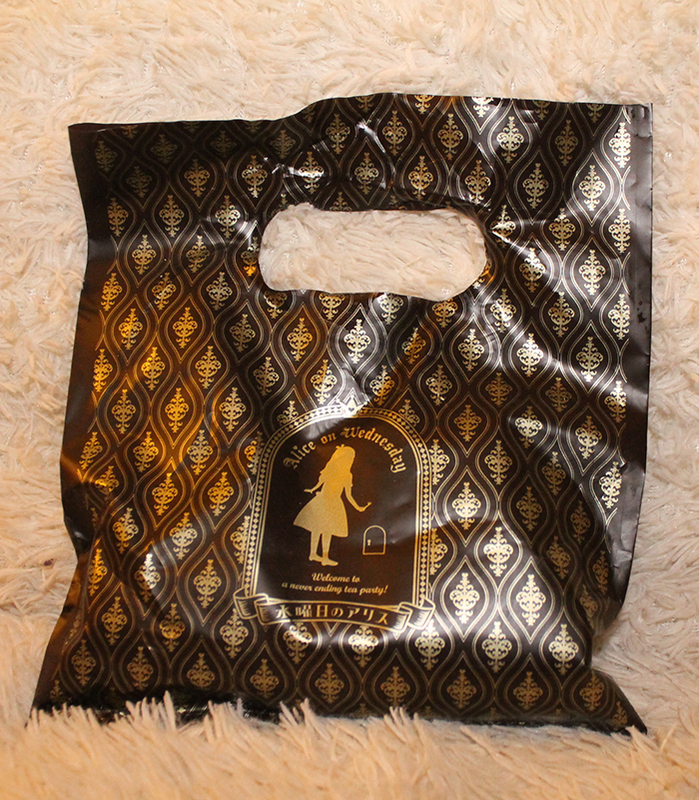 There were so many adorable things that it was hard to go in and leave empty handed. I couldn’t help but pick up this bottle of lemon-lime pop, which in Japanese is referred to as サイダー (cider). They also had “Eat me” cookies, but they didn’t look as appealing. They had an awesome collection of flavoured popcorn, and I do regret not getting one of those. 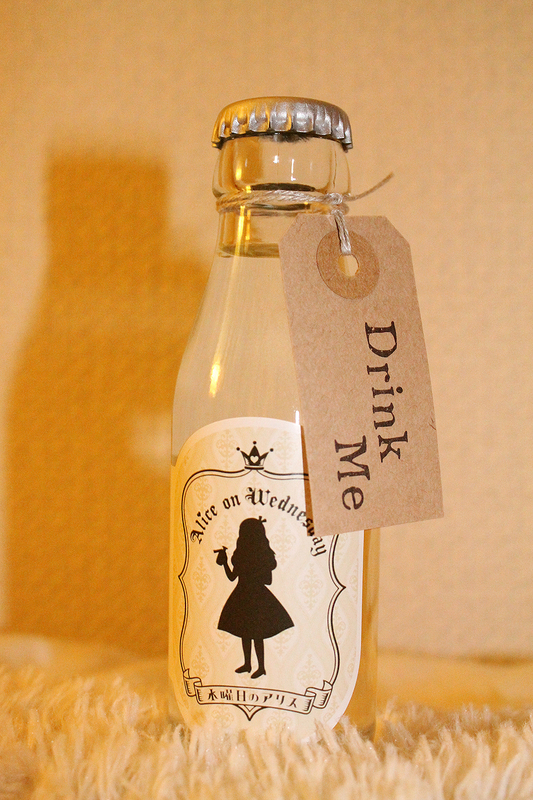 If you’re interested in checking out Alice on Wednesday it’s pretty easy to get to! Take the Tsurumai subway line (blue) to Oosu Kannon (大須観音). Go out exit 2 and walk straight until you see a temple on your left. From the temple there are two entrances to the shopping area, take the one closer to the temple and you’ll be able to find the shop pretty quickly. Hopefully next time I’m there they’ll have some interesting popcorn flavours! I DEMAND MORE POPCORN AND COOKIE COVERAGE. Hi. Just went there this afternoon with my 16 yr old daughter. She loved it! She also couldn’t resist their nice accessories, so she got a necklace & some tea. Their popcorn looks delicious. Maybe we’ll get some on our next visit. This is really a must visit when you’re in Osu Kannon area.